Filmed on location in Arkansas for 39 days starting on September 26, 2011, Mud was the largest film production to set up camp in “The Natural State.” When it opened at the prestigious Cannes Film Festival, the film received an 18-minute standing ovation. Directed and written by Jeff Nichols, who grew up in Arkansas and was recently nominated for Best Director for the 2014 Indie Spirit Awards, Mud stars Matthew McConaughey, Reese Witherspoon, Tye Sheridan (The Tree of Life), and Jacob Lofland (a young actor also from Arkansas). PHOTO CREDIT: Jeff Nichols directs McConaughey, Sheridan and Lofland on the set of Mud (photo from IMDB). The story centers around two young boys (Sheridan and Lofland) and the eccentric, titular character named Mud, a fugitive with a mysterious past played by McConaughey. In addition to helping Mud get away from his bounty hunters, the boys also try to reunite him with his true love (Witherspoon). PHOTO CREDIT: Still of Jeff Nichols and Matthew McConaughey on the set of Mud. Having worked on the script for Mud (specifically with McConaughey in mind) since the 1990’s, it’s Nichols’ biggest film to date. Mud evokes the romantic world of Mark Twain as it focuses on the friendship between two pre-teen boys in the midst of a timeless, mythical Mississippi River setting. Not surprisingly, The Adventures of Huckleberry Finn was a required reading during the filming for the two young actors Sheridan and Lofland. When asked how he came up with the idea and locations for the Mud screenplay, Nichols immediately gave credit to a book he had stumbled upon long ago. “The original inspiration came from a photographic essay I found in the Little Rock Public Library called The Last River that is about people who make a living off the river in lower Arkansas and in Mississippi,” said the director. The book also features houseboats by the river which inspired many of the settings for Mud. PHOTO CREDIT: Above photo of The Last River book is from Amazon. The Last River is such a huge inspiration for Nichols that he even features the diving helmet shown in the book in his movie. The diving helmet was made from a hot water heater with weights on the front to help keep the diver anchored at the bottom of the river as they collect mussels. These mussels were then made into mother-of-pearl buttons or sold to Japan (for the cultivation of cultured pearls). Below are screenshots of the diving scenes from Mud. The first image features the diving helmet in action. The second screenshot is a scene in which Galen (Michael Shannon), Neckbone’s uncle who dives for mussels for a living, inspects the day’s catch on his boat. Here are two photos taken from The Last River, photographed by the author Turner Browne, which have inspired Nichols to write and film the above scenes. The feeling, it turned out, was mutual. Arkansas was also elated to have Mud filming in its backyard. “The enthusiasm here for this film resembled an old-fashioned barn-raising. Everyone wanted to be a part of it, to support it,” said assistant locations manager and Little Rock native David Fowlkes. Many Arkansans even generously offered the use of their cars, trucks, and homes as settings and props for Mud. An homage to the 1980’s coming-of-age films Stand By Me and The Goonies, as well as Mark Twain’s Huckleberry Finn, Mud was filmed in Southeast Arkansas, in the towns of Dumas, De Witt, Lake Village, Crocketts Bluff, and Stuttgart. Mud employed over 100 cast and crew members, half were Arkansas residents. It also hired over 400 locals as extras. To be as authentic as possible, the filmmakers portrayed each location’s interior and exterior exactly as they were. “Shooting on location and staying away from sets gave the film a naturalistic look and palpable authenticity,” said Stone. 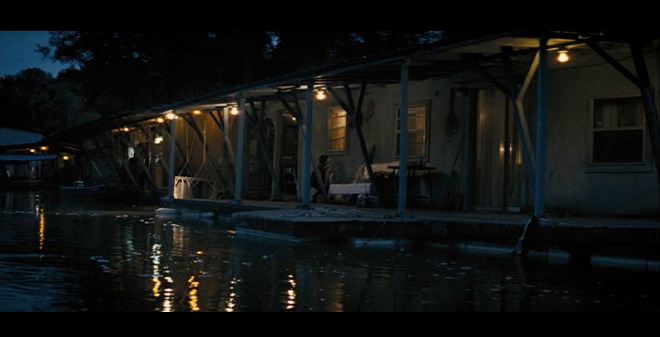 In 2006 while on a trip researching for the movie, Nichols visited his second cousin who owned a houseboat in the area where Nichols was location scouting. It’s not a coincidence that Nichols ended up filming Mud in the houseboat right next door. PHOTO CREDIT: Above is a screenshot of Tom Blankenship (Sam Shepard) standing on the roof of his boathouse. PHOTO CREDIT: Above is a screenshot of Ellis as he looks into the houseboat where he’s living with his parents. 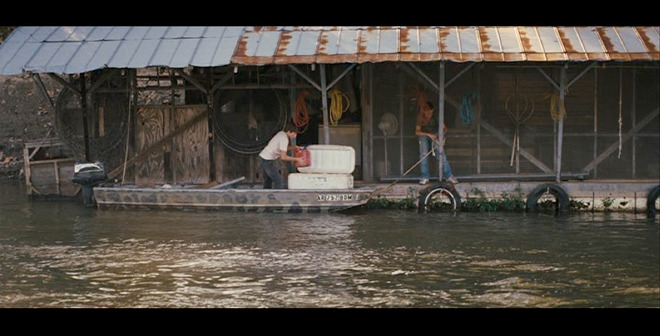 PHOTO CREDIT: Screenshot of Ellis and Neckbone as they gather materials in front of Ellis’s houseboat. To preserve authenticity, the interior scenes in the houseboat were filmed in the real houseboat itself. “The boat was small and cramped, so we brought in most of our light through windows,” said Stone. PHOTO CREDIT: Above screenshot is of Ellis sleeping in his own bedroom on his parents’ houseboat. The production department and the director made sure that each piece of prop and furniture used on the set was as authentic to the character it supports as possible. For example, in the screenshot below, we can see a small stack of books on the coffee table to the left of Tom Blankenship played by Sam Shepard. The book on top is an old edition of Don Quixote since Shepard believed his character would most likely read that novel. PHOTO CREDIT: Above is a screenshot of Tom Blankenship (Sam Shepard) in his houseboat. 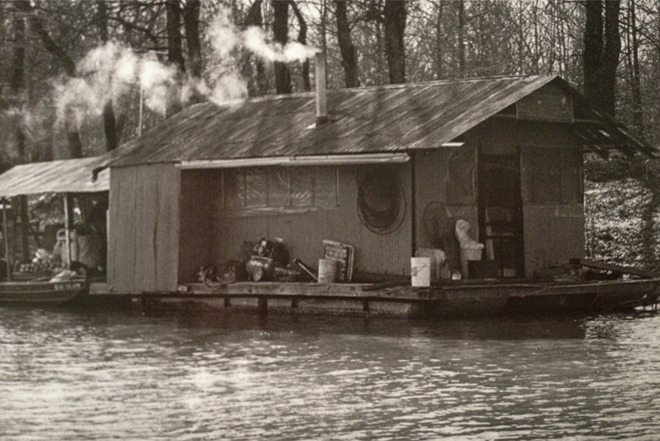 Here’s a photo from the book The Last River (photographed by Turner Browne) of an original houseboat similar to the ones used in Mud. Today, not many people live on these houseboats. They’re now mostly used as hunting lodges or fishing cabins. 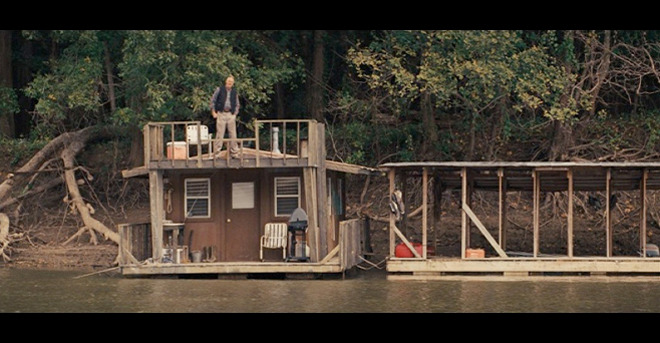 The houseboats used in Mud, as well as many of the other Mud filming locations, center around the Mississippi River. “It’s one of the most winding rivers in the world and you never know what’s coming — and that’s what the movie is like,” said Nichols. PHOTO CREDIT: Screenshot of Ellis and Neckbone riding their boat down a channel toward the open Mississippi River. The island featured in the film is an actual and difficult-to-reach island on the Mississippi River. “We would arrive at base camp before sunrise, and jump in pontoon boats loaded with equipment. Then we would motor two miles downstream, dock on the beach, unload the equipment, walk to the shooting location, hide all the overflow equipment with branches, pull out the STEADICAM, and then shoot,” said Stone. PHOTO CREDIT: Above screenshot is of the island mentioned above where Ellis and Neckbone like to explore. PHOTO CREDIT: Screenshot of Ellis and Neckbone as they see Mud for the first time on the island. The natural beauty of the island made filming on it a bit of a challenge. Everywhere the camera looked, there was something worth filming. In the screenshot below, Mud, Ellis and Neckbone are walking across a part of the island that reminded the director of the surface of the moon. PHOTO CREDIT: Screenshot of Mud, Ellis & Neckbone walking across a dry, cracked, moon-like area on the island. Even though in the script Mud’s boat-in-a-tree house is located on the island, the actual location where the movie was filmed was in the hamlet of Crockett’s Bluff. 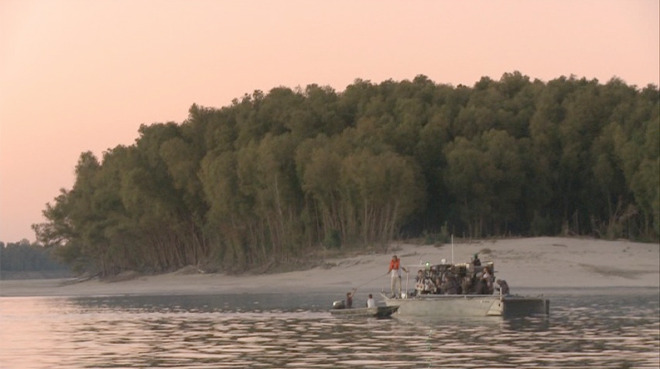 The production had to scout many locations before they found the perfect tree by the White River for Mud’s boat. And then, to set the boat onto the tree required tremendous team work from everyone. 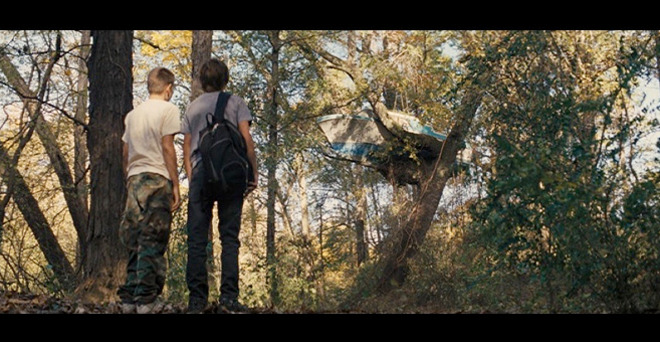 PHOTO CREDIT: Above is a screenshot of Ellis and Neckbone looking up at Mud’s boat-in-a-tree house. 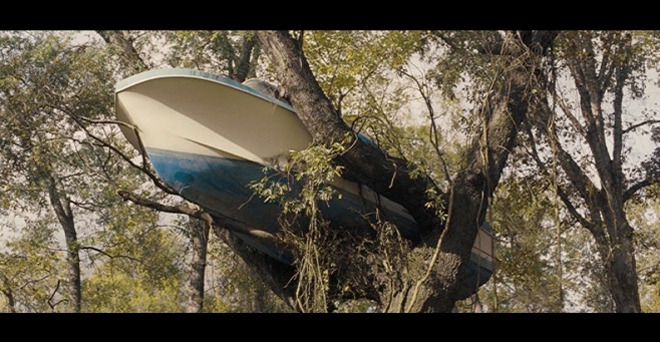 PHOTO CREDIT: Above is a screenshot Mud’s boat-in-a-tree house. In the town of Dumas, the majority of the scenes filmed off of Highway 65 at the Piggly Wiggly, a local grocery store that reminded Nichols of his childhood in South Texas. 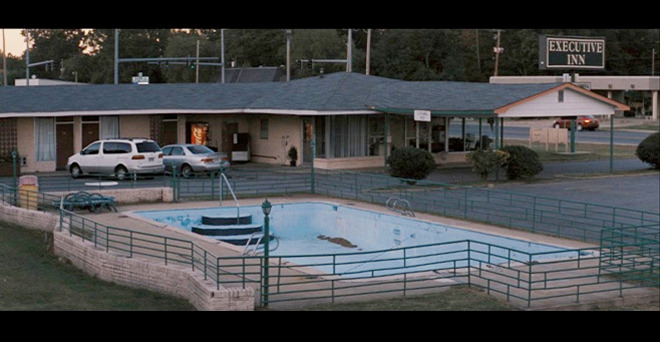 The production scouted the entire state of Arkansas looking for a grocery store that’s in close proximity to a motel. Christopher Crane, Arkansas Film Commissioner, called Nichols one day to tell him that he’s found the perfect grocery store for Mud. After looking at the photographs Crane sent him, Nichols knew they had found the backdrops for his movie. PHOTO CREDIT: Above screenshot is from a scene in front of the Piggly Wiggly. PHOTO CREDIT: Above screenshot is of Ellis as he follows Juniper (Witherspoon) around inside the Piggly Wiggly. PHOTO CREDIT: Above screenshot is from a scene filmed at The Executive Inn where Juniper (Witherspoon) is staying. The production also used many other businesses along Highway 65 as its film locations, including The Tobacco Store, The Big Banjo, and the El Torito parking lots. Other Dumas locations featured in the movie are Stimson Farm, Gail’s Sports Bar, and The Pendleton Inn. 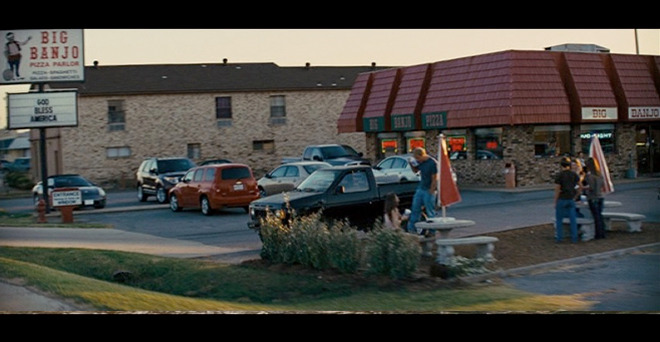 PHOTO CREDIT: Above screenshot is from a scene filmed in front of Gail’s Sports Bar. “The owner of this bar was really great to us,” said Nichols about Gail’s Sports Bar. “They closed down for us and a lot of extras. I think they had fun with it." PHOTO CREDIT: Screenshot of the Big Banjo, one of the film locations in Dumas, Arkansas. Having a production filming in town helped increase sales for many of Dumas businesses, including gas stations, restaurants, and stores. Dumas tourism also experiences a boost as more tourists arrive daily to spend a night or two at The Executive Inn and check out the Piggly Wiggly next door. Everyone is eager to experience their own take of Mud country. One of the film locations of Mud was a marine junkyard in Stuttgart. Nichols found the junkyard before he wrote the script and thought it was a “really cool location.” He liked it so much that he wrote it into the script. During filming, the production department didn’t have to do much to set up the scene because everything needed to make an impact was already there. Ah! The beauty of filming on location! PHOTO CREDIT: Above is a screenshot of Ellis and Neckbone at the junkyard gathering materials to help Mud getaway. During filming, the production set up its headquarters at the former Clary Elementary Building in Stuttgart (107 East Superior Street). Stuttgart residents were thrilled to see filming activities in their area. “Everyone’s really excited about it, it’s been really great for the town,” said Stephen Bell, director of the Stuttgart Chamber of Commerce. “The local production company came to the Chamber of Commerce early on and let us know they were going to buy as much of their materials and use as many of the local stores as they could and they really have been great to work with and they really have done that,” shared Bell. PHOTO CREDIT: Above is a behind-the-scene screenshot from the Special Features of the DVD. As briefly mentioned above, Arkansas Film Commissioner Christopher Crane had a big role in bringing Mud to the state. Crane has held the post of film commissioner for Arkansas since August 2007. This means that on a daily basis, he oversees the promotion, recruitment and development of the state’s film industry. To sum it up, he actively markets Arkansas as a film location to both the national and international film industry. I can tell you that you should have conversations with many of the vendors used during the filming of “Mud”; they will sing its economic praises. These production companies purchase local goods and services and increase short-term employment and spending throughout the area. When you look at the impact, you truly do need to couch it in terms of having a huge convention in your area for several months. When speaking about just the cast and crew, these people rent houses, apartments, hotel rooms, eat, drink, buy gas, use the dry cleaners, buy local art, go to local entertainment venues, etc. They literally live in your community just as you do, and that’s not taking into account the direct spend of the production on the items needed to create the film itself. I think the circulation of the dollar on local level far exceeds the “impact model” that several detractors of film incentive programs use. “Mud” is also just a fantastic film — superbly acted, directed and shot. It’s a great calling card for what can be accomplished in film in Arkansas. 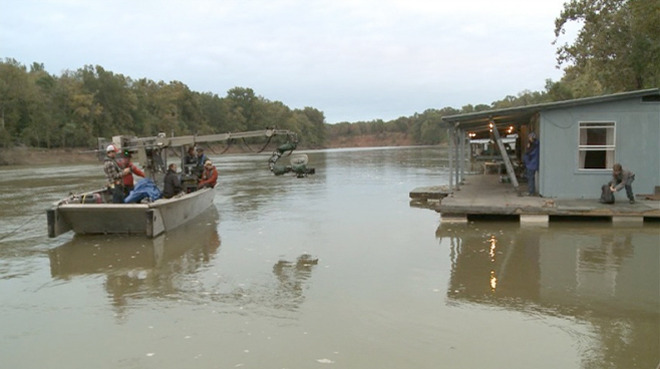 Not surprisingly, the love affair between Arkansas’s Delta Region and the cast and crew of Mud is a two-way street. If you’re interested in Arkansas locations available for filming, visit the Arkansas Film Commission’s website.